Homeowners! Don't risk it - secure your ladders with Ladder Grips. Although householders seldom use ladders on a daily basis, most do use them from time to time to carry out a range of tasks such as property maintenance, things like painting the outside of their properties, cleaning gutters, even cutting the tops of very high hedges. Statistics show that every time you climb a ladder, you are taking a significant risk. 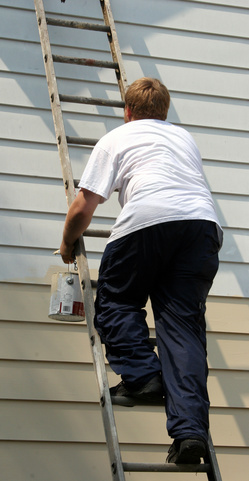 Ladders are the single highest cause of fall from height accidents involving serious injury and even death. There are many reasons for this, uneven ground putting ladders at an angle, the lack of grip where the ladder is placed against a sufrace and ladder users overreaching whilst up a ladder. But you can significantly minimise the risk of climbing ladders with Ladder Grips - a revolutionary ladder safery device which improves ladder stability by up to 350%. Tests have shown that even where ladders have been placed on castors or an an angle and climbed, the ladder still holds firm. Now of course, we never recommend placing ladders on castors or at an angle before climbing them, but, it demonstrates just how effective Ladder Grips are in significantly reducing the risk of unecesary ladder accidents. Stay secure, stay safe. Order your Ladder Grips today!